In HEK293T cells, ST2825 specifically inhibited homodimerization of MyD88 TIR domains with 40% inhibition of dimerization at 5 μM and 80% inhibition at 10 μM. This effect was specific for homodimerization of the TIR domains and did not affect homodimerization of the death domains. 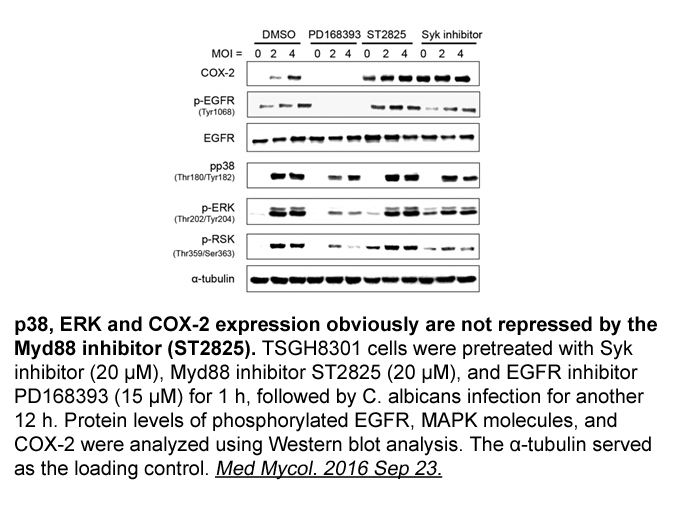 Moreover, ST2825 interfered with recruitment of IRAK1 and IRAK4 by MyD88, causing inhibition of IL-1-mediated activation of NF-κB transcriptional activity . B cell proliferation and differentiation into plasma cells in response to CpG-induced activation of TLR9 were also suppressed by ST2825 (> 8 μM). These results showed that ST2825 blocked IL-1R/TLR signaling by interfering with MyD88 homodimerization and suggested that it may have therapeutic potential in treatment of chronic inflammatory diseases . TLR9-induced plasma cell (PC) generation was blocked by ST2825 in Peripheral blood mononuclear cells from SLE patients . IL-1 beta-induced production of IL-6 was dose-dependently inhibited by ST2825 (100 or 200mg/kg daily) in treated mice . In a murine model of non-reperfused acute myocardial infarction，ST2825 (25 mg/kg) protected left ventricular from dilatation and hypertrophy. No measurable reduction in infarct size was found .
. Loiarro M, Capolunghi F, Fantò N et al. Pivotal advance: inhibition of MyD88 dimerization and recruitment of IRAK1 and IRAK4 by a novel peptidomimetic compound. Journal of Leukocyte Biology (2007), 82(4), 801-810.
. Van Tassell BW, Seropian IM, Toldo S et al. Pharmacologic Inhibition of Myeloid Differentiation Factor 88 (MyD88) Prevents Left Ventricular Dilation and Hypertrophy After Experimental Acute Myocardial Infarction in the Mouse. Journal of Cardiovascular Pharmacology (2010), 55(4), 385-390.
. Capolunghi F1, Rosado MM, Cascioli S et al., Pharmacological inhibition of TLR9 activation blocks autoantibody production in human B cells from SLE patients. Rheumatology (Oxford). 2010 Dec;49(12):2281-9. 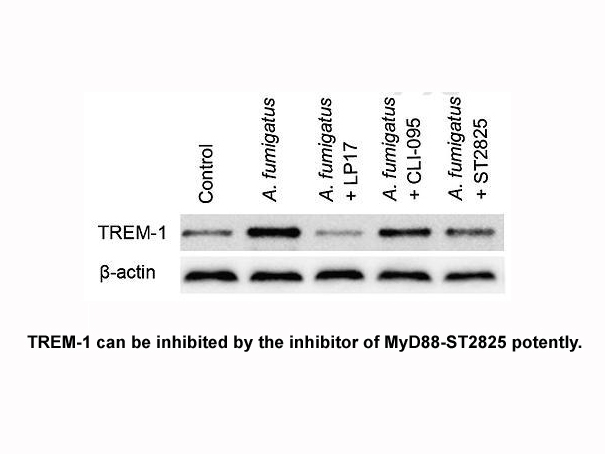 ST 2825 is a specific inhibitor of MyD88 dimerization . 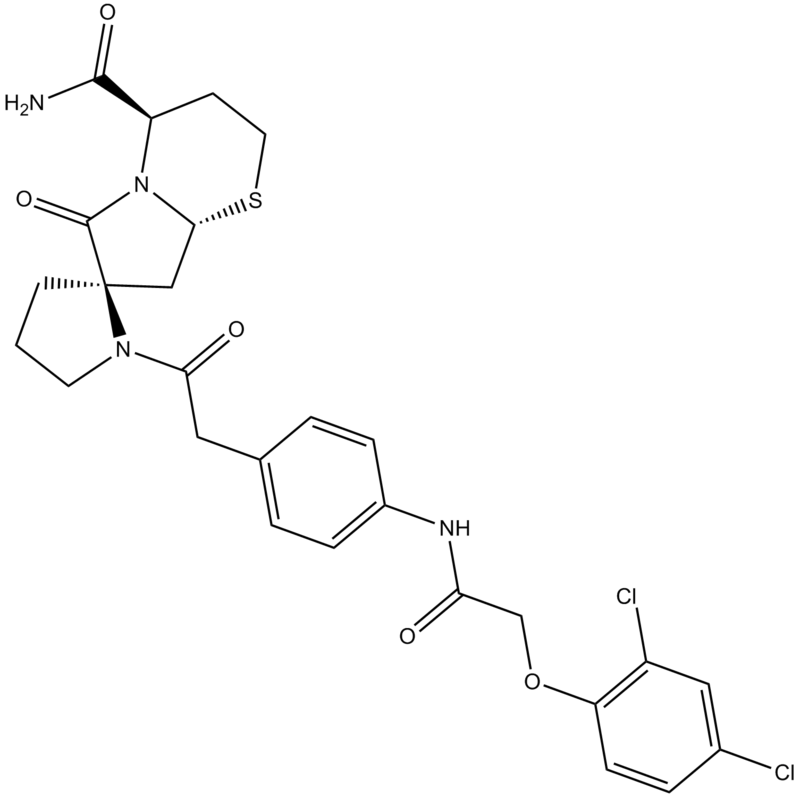 ST 2825 is a synthetic compound which mimics the structure of the heptapeptide in the BB-loop of the MyD88-TIR domain and interferes the homodimerization of MyD88. ST 2825 was proved to specifically inhibit the homodimerization of MyD88 TIR domains without affecting the homodimerization of death domains. 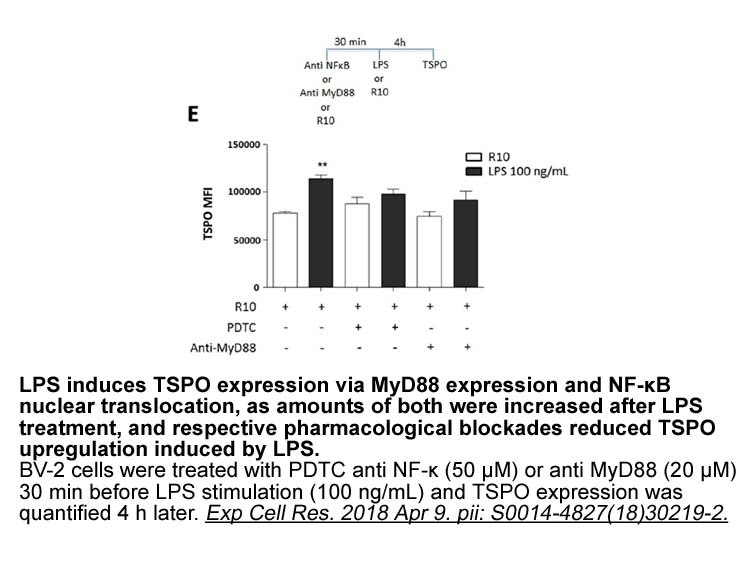 In HEK293T cells transfected with Flag-MyD88 and Myc-MyD88, ST 2825 inhibited the interaction of the two MyD88 by 80% at the concentration of 10 μM. This inhibition resulted in the subsequent interference of the IRAK1 and IRAK4 recruitment. Besides that, administration of ST 2825 significantly inhibited the IL-6 production stimulated by IL-1β at doses of 100 and 200 mg/kg in mice. 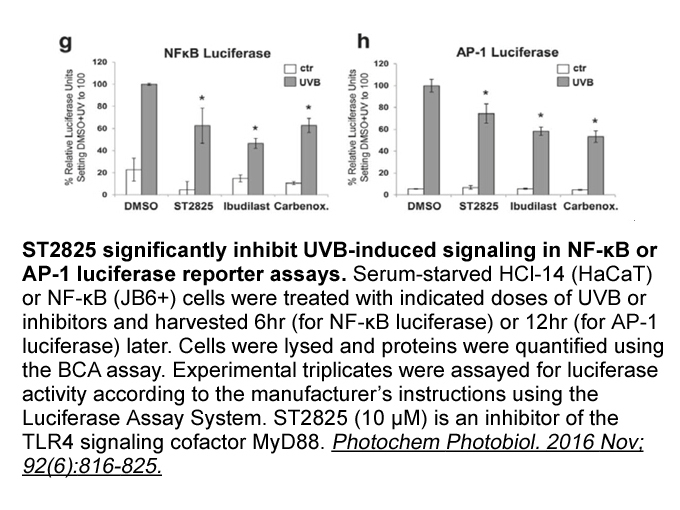 Furthermore, 8 μM ST 2825 completely blocked the TLR9-induced B cell proliferation. ST2825 also suppressed the generation of plasma cells induced by CpG dose-dependently . Loiarro M, Capolunghi F, Fantò N, et al. Pivotal Advance: Inhibition of MyD88 dimerization and recruitment of IRAK1 and IRAK4 by a novel peptidomimetic compound. Journal of leukocyte biology, 2007, 82(4): 801-810.